Our deck and pool with vistas of the outer islands. Fully equipped resort condominiums on beautiful Sapphire Beach, next to Sapphire Beach Resort and Marina. Sapphire Beach is world famous as one of the Virgin Islands' finest white sand beaches. Crystal Cove guests have easy access to the restaurants, beach shop and water sports at Sapphire Beach Resort and Marina. Sapphire Beach Resort offers excellent dining at two restaurants. To view our suites, take the Crystal Cove Photo Tour. Comfortably and casually furnished, there's lots of room. Choose from studio or one-bedroom suites. Crystal Cove overlooks a small pond with the beach and ocean beyond. All suites have clay tile floors, wood and rattan furniture, and air conditioning. There are full kitchens for when you choose to "dine-in". 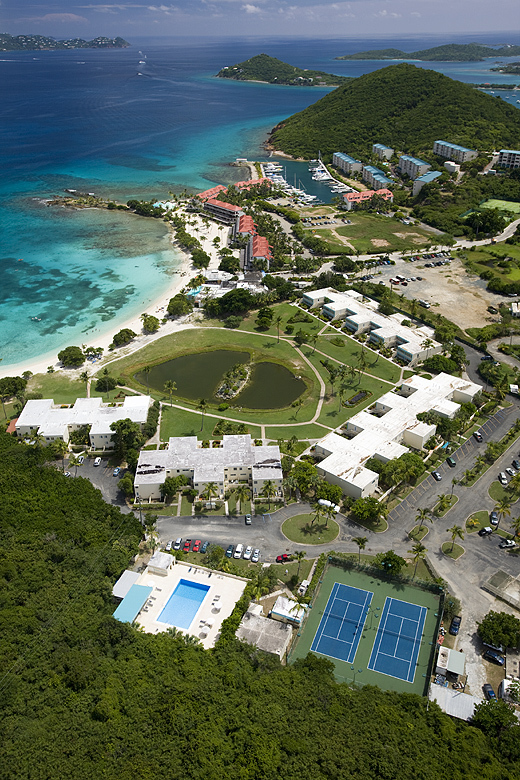 Crystal Cove offers a great park-like open space ideal for children to enjoy within view of your suite. This resort has lighted tennis courts and a large swimming pool. Snorkeling equipment is free for Crystal Cove Resort guests. Sapphire Beach access is free. Ferry trips to St. John and the Virgin Island National Park are just minutes away.